The Polaris timer console is at the heart of all our timing systems. The Polaris is a full featured, multi-event timer for timing of equestrian events including barrel racing, pole bending, roping, team penning,	bull riding, cutting, show jumping and more. 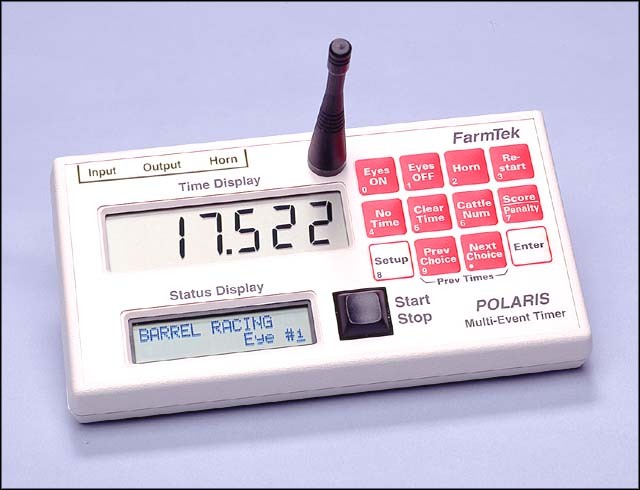 The Polaris timer is also used in a wide variety of non-equestrian events including lap timing, autocross, drag racing, track and field events, speed training, and dog agility trials. Wireless operation means easy set-up and tear down. No power connection, no cables to the electric eyes, even the spectator displays (scoreboards) can be driven wirelessly. The timer console runs 50-60 hours from a set of four AA alkaline batteries. Time is displayed on a high contrast LCD display with extra large 0.7 inch tall digits. Easily readable even in direct sunlight. A convenient keypad allows simple, single button access to the Polaris' powerful features. Different time formats are automatically selected for each different event (e.g., seconds to .001, seconds to .01, minutes and seconds, counting up, counting down, etc.). You can also choose your own time format as well. Previous times are saved along with penalty (if entered) and any event-specific information such as score, broken barrier, cattle number, lap number, jumping round, etc. Accurate time is maintained even while the timer is stopped. This allows resumption of timing after accidental interruptions. No more lost times! Alignment status of each electric eye is always present on the status display. 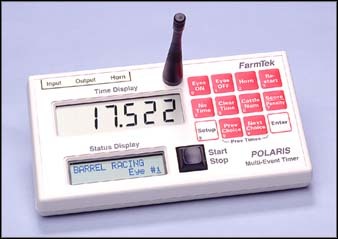 The Polaris timer console is generally sold as part of a complete timing system. To learn more, choose the application that is closest to your event from the list shown on the left.